« Is navel lint ripe for the picking? French pharmacies: do you like sick jokes? Nadjenka Boudjilivitch suggested ‘pharmacy visits’ as a rich topic of humiliation. Suggest your own topic for a personalised embarrassment-related post. Pharmacies in Paris combine the patient confidentiality aspects of a medical clinic with the shopfloor ambience of H&M. For these reasons, if you have a choice of staff, it is best not to approach the older – and therefore deafer – pharmacist for advice. This potential for embarrassment has led some enterprising young French people to make gain from the pain. A few years ago, a young business school graduate launched a successful online business to deliver adult diapers in inconspicuous packaging to your home addresses. His website even has a blog. The last time I was in a pharmacy it was with my housemate. We needed to buy a syringe. The pharmacists presented a 30ml model. “Do you have any bigger?” I asked. She presented a 50ml version. “We’re going to need something more substantial,” I said. Rummaging she pulled out a 100ml. “No…do you have anything for use on large animals?” I asked, nodding at my housemate for approval. By now the curiosity got the better of her. I could see she wasn’t going to search further without knowing what we needed it for. Looking from me to my housemate, I could see her wondering which of the two would be the lucky recipient. “Well I don’t know if we have anything that big, but I’ll see what I can find,” she responded. 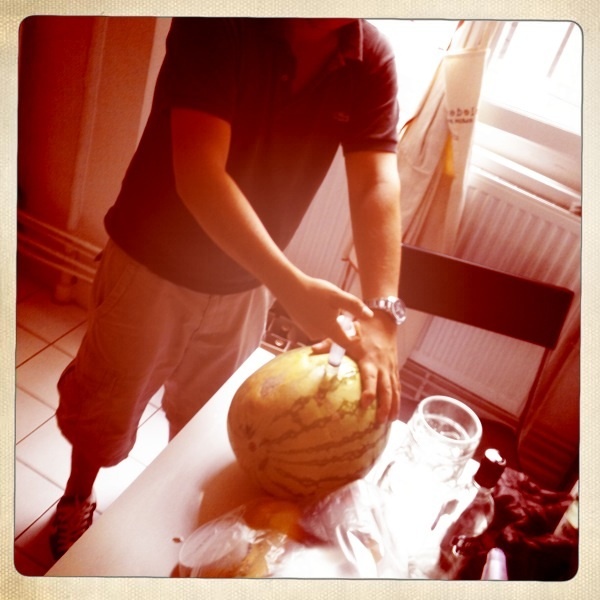 Who knows what the pharmacist thought, but for the housemate and I, we made one damned good vodka watermelon. This entry was posted on October 25, 2010 at 12:17 am and is filed under Uncategorized. You can follow any responses to this entry through the RSS 2.0 feed. You can leave a response, or trackback from your own site. Try picking up y**st infection meds for a guy friend. The pharmacists didn’t believe that I wasn’t asking for moi and neither did the people listening in line behind me.